Brian T. Mahon is the founding partner of Mahon, Quinn & Mahon and an experienced trial attorney. A 1970 graduate of the College of the Holy Cross, Mahon received his law degree from Vanderbilt University School of Law in 1973 and was admitted to the Connecticut Bar that same year. He is also admitted to practice before the Federal District Court for the District of Connecticut. Among his bar activities, he served as President of the New England Bar Association, an organization which encompasses all six New England States. He was President of the Connecticut Bar Association from 1995-1996 and was Chairman of the Young Lawyers Section of the Connecticut Bar Association from 1981-1982. 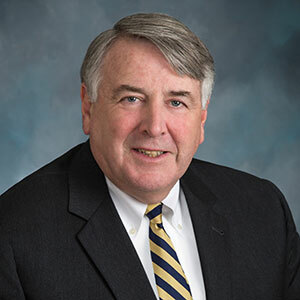 He also successfully chaired the Connecticut Bar Association's Headquarters Search Committee, resulting in the relocation of the CBA to a new building in New Britain, Connecticut, and is a Fellow of the Connecticut Bar Foundation. He also served for many years in the House of Delegates of the American Bar Association, and is a Fellow of the American Bar Foundation. In addition, he served as a member of a committee within the ABA dealing with Solo and Small Firm practices and has chaired an ABA standing committee concentrating on issues involving real estate and title insurance. Attorney Mahon regularly meets with a select group of attorneys on an advisory panel to the Chairman of the Connecticut Workers' Compensation Commission. He is a member of the Connecticut Trial Lawyers Association and the American Trial Lawyers Association. In 2015, Mahon received a lifetime achievement/professional excellence award from the Connecticut Law Tribune. Attorney Mahon's practice has centered around representing victims who have suffered injuries as a result of automobile and motorcycle accidents, fall downs, dog bites, medical negligence as well as work-related injuries (namely workers' compensation cases). A recognized authority in these fields, Mahon frequently receives referrals of difficult cases from attorneys in Connecticut as well as other states. He is a frequent speaker at seminars for attorneys and judges, and has been appointed as a court arbitrator by the Chief Court Administrator of the State of Connecticut. He also serves as a private mediator and arbitrator in personal injury and workers' compensation matters. In 2004, Mahon was elected as Judge of Probate for the District of Meriden, Connecticut. He served as the first Vice President of the Probate Judge's Assembly and became President of the Assembly in 2016. In 2018 Mahon retired as probate judge after nearly 14 years of service. Attorney Mahon is active in many civic organizations in Meriden including the Meriden Lions Club. He is a past President of the Meriden VNA and was Chairman of the Meriden Democratic Town Committee. He was a member of the Courthouse and Police Complex Building Committee, and for over twenty-five years was co-chairman of the Holy Cross Class of 1970. He has coached girls' softball and has been a long-time participant in the Meriden Men's Softball League. The father of four children and a fourth generation Meriden resident, Mahon resides here with his wife.